Soak the Aval for 15 mins & strain. Melt ghee in a hot pan, add crushed cashewnuts,soaked aval to saute few seconds. Add milk to the mix allow to boil ,add sugar. Keep it simmering until everything gets mixed & Finish with saffron . hey, how long do u have to boil the milk with aval? i will try this one..
Looks like I'd like that too! All your food is so yummy! We used to have Aval velayichathu, but payasom is new to me. Hi mahima.. 10 to 15 mins to boil . I've made kheer and it's great. Yours sounds delicious. I love the natural color of saffron. The dessert looks very simple.Is Aval same as poha? Looks gr8! I have something for u in my blog... check it out! 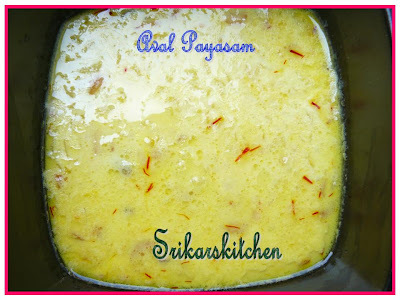 Payasam looks great.. mouth watering priya. Looks great..this one is quick to make right! I make something very similar with almond milk. Looks lovely, Sripriya. hey i tried this recipe.. it was great!! check out my blog for pic and recipe. Your kher looks too good. never heard of aval...must try to find it at my asian grocer.Tks for sharing.